The Vermont Fire Academy is based in Pittsford, VT with a primary focus of delivering training to responders throughout the state. This website is used to distribute timely course information and is updated on a continual basis, so please check back frequently and feel free to contact us with any questions you have. Keep up to date with all of our course announcements and news by joining our e-mail list. 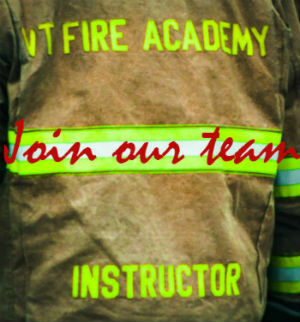 The Vermont Fire Academy is accepting requests for Firefighter I, Firefighter II, Firefighter I/II and other certification programs to be held in FY20. If your fire department or county firefighter association would like to host a firefighter certification training program in the upcoming fiscal year, fill out the enclosed Request for Training form and submit it to the Vermont Fire Academy by 4 PM on June 3, 2019 for consideration. Requests submitted after this date will not be accepted. Awarded programs require a minimum of 15 students pre-registered two weeks in advance of the program start date. The program locations are finalized by the Vermont Fire Academy Staff, with the concurrence of the Vermont Fire Service Training Council at the June Vermont Fire Service Training Council meeting. Award notifications are sent shortly after the June Vermont Fire Service Training Council meeting and typically no later than July 1st. The awarded programs typically start in late summer / early fall of that same year. Adequate host facilities (classroom, area for practical skills, accommodations for building access). History of previous courses and programs hosted in the county. Parking for students, instructors, and Vermont Fire Academy equipment trailers – up to tractor trailer size. Site security, including snow removal in the winter. When receiving multiple requests for programs in a geographic area, priority may be given to those submitted by a county organization or multiple departments. Requests accompanied by a significant number of completed General Admission Applications from applicants for pre-registration will be a given higher priority. If you have any questions or would like additional information, please call the Vermont Fire Academy at 800-615-3473. The Vermont Fire Academy has developed a new course titled Entry Level Exterior Support Firefighter. This course was developed after receiving input from the Vermont Fire Service and is designed to assist local fire departments in establishing training programs for exterior support firefighters. This training package provides fire departments with the lesson plans, presentations, and skill drills necessary to conduct successful Exterior Support Firefighter Courses. This course offers you the flexibility to deliver the training at your department in a manner that fits your needs. Participants will be introduced to the curriculum and gain an understanding of how to use the course materials. This Train-the-Trainer Session is intended for local firefighters, instructors, or training officers who are responsible for conducting local or regional training and possess basic firefighting knowledge and skills. All participants will receive the full curriculum package and course materials that can be used to conduct local course deliveries. Topics will include: History and Orientation, Communications, Personal Protective Equipment, Firefighter Safety, Fire Behavior, Ladders, Extinguishers, Tools, Hoses, Nozzles, Water Supply, and Building Construction. There is no charge for this Train-the-Trainer Session but pre-registration is required by submitting a completed General Admission Application to the Vermont Fire Academy by the application deadline. General Admission Applications can be downloaded here. Since seats are limited, departments may be asked to only send two members per venue.Participants are on their own for lunch. The Vermont Fire Academy is seeking qualified, experienced, and motivated individuals for the following part-time positions. If you have a desire work within the fire service and and share your knowledge and experience with others, then we would like to hear from you. Click on the links below for more information on each position. Click here for the course brochure, forms and details.